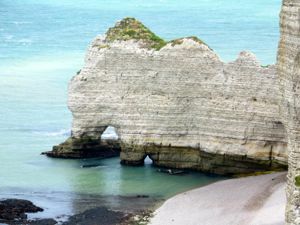 Falaise Amont and Falaise Aval surround Étretat with stunning views. 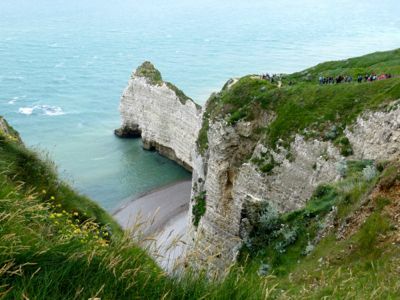 Étretat enjoys a unique location, with the Falaise Amont to the north of the town center and the Falaise Aval to the south. Above, Beautiful view of the Falaise Amont. You can reach either one by foot from the beach in the center of town. You can also drive down a narrow road to the Falaise Amont. 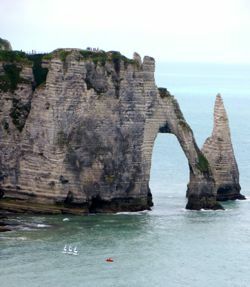 The Falaise Amont offers beautiful views of the Falaise Aval and some of the arches formed by the falaises. In addition, you get a great view of the Hollow Needle, or Aiguille Creuse. At the top of the Falaise Amont is the small Chapelle Notre-Dame de la Garde. The original chapel, built in the 1850s, was destroyed during World War II. The present chapel dates from 1950. You can walk along the top of the falaises and enjoy the ever changing views of the sea and the countryside. You might even see some Norman cows grazing. As the light changes with the time of day and/or weather, you will be treated to a spectacular show of natural beauty. Above, The Falaise Aval and the Aiguille Creuse (Hollow Needle). Below, An interesting section of the Falaise Amont.